You are here: Home / Featured / Falcon (Sam Wilson, Captain America) Reading Order! Falcon (Sam Wilson, Captain America) Reading Order! Sam Wilson, most commonly known as Marvel’s Falcon through the years, is one of the best heroes to emerge as partners to early Marvel icons. Rather than merely stand-in as Captain America’s sidekick, Falcon asserted himself early on as an equally capable hero, even claiming a rightful spot in the comic book title with Captain America and the Falcon. In more recent years, Sam has taken on the mantle of Captain America and become a core fixture with the Avengers. It’s an absolutely fascinating career arc, and Sam brings plenty to the Captain America title that Steve Rogers never could. Below you’ll find a complete reading order for the hero formerly known as Falcon. As always, let’s hear your thoughts in the comments, and enjoy the comics! 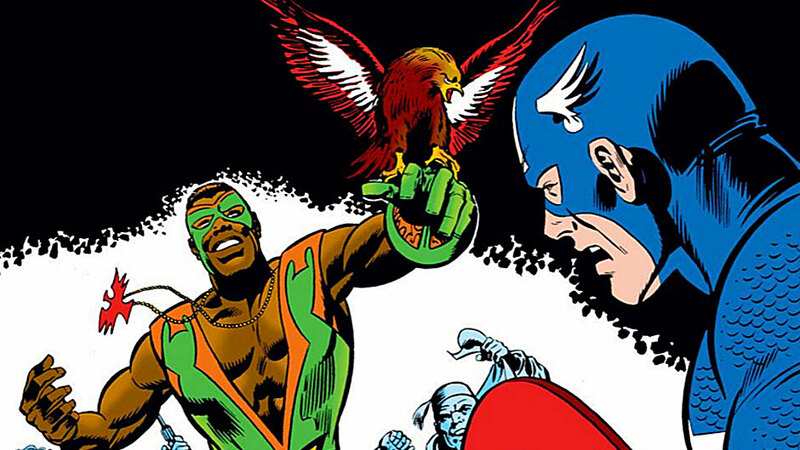 Sam Wilson, The Falcon, is introduced in a classic showdown versus the Red Skull. Cap’s solo series actually became Captain America and the Falcon from issues #134 to #222. From this point forward in Marvel history Sam Wilson is inextricably tied to the Captain America series. Marvel’s 2017 summer event, Secret Empire, actually started as an eight issue stretch of Captain America comics in the 1970s. There are a number of Marvel Cap stories that sneakily skewer sitting U.S. presidents, and Secret Empire is certainly one of the top. Sam spends a very brief stint joining the Defenders. Jack Kirby takes over on Captain America and the Falcon, with the classic “Madbomb” storyline. Kirby’s Cap is all enthusiasm and mad sci-fi, and Sam Wilson plays a crucial early role in the narrative. Sam’s longest stint with the Avengers to date comes at the hands of a diversity mandate by Avengers government liaison Henry Peter Gyrich. 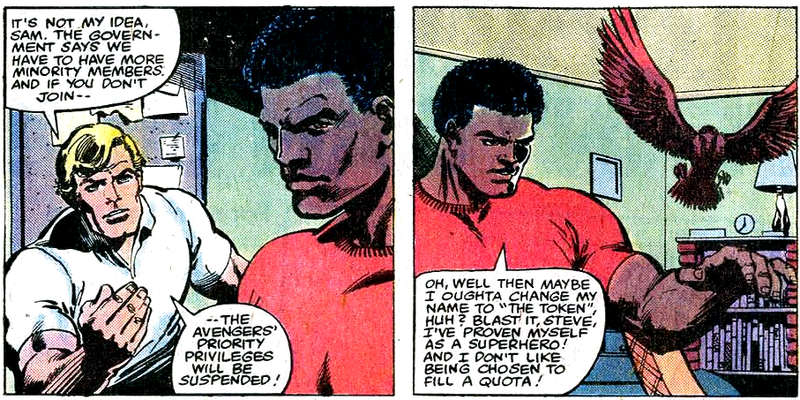 Although the rationale won’t sit well with Sam, it does get Falcon in some major Avengers stories from the early 1980s. Solo miniseries from Chris Priest, win which it’s declared that Sam Wilson is… a mutant?! Sam plays a peripheral role in this classic showdown between Captain America and the Red Skull. Falcon joins Spidey and Daredevil in stopping a Gang War. 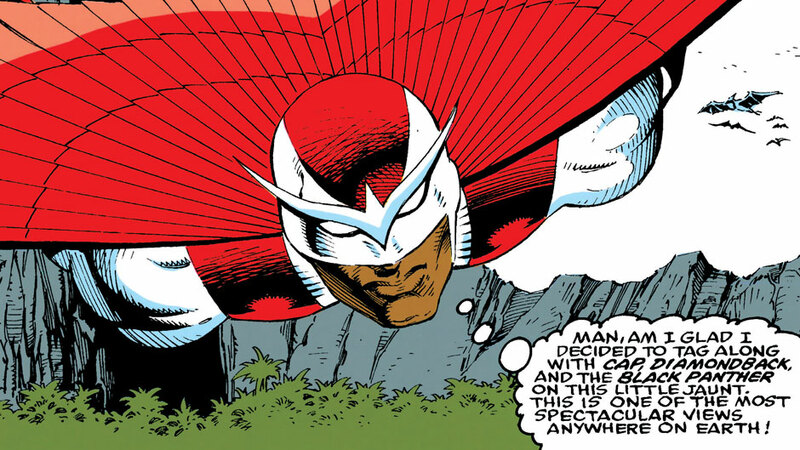 This lengthy look at Cap’s crisis of conscience in the American Dream – by longtime Captain America writer Mark Gruenwald – features Falcon as a key supporting player. Definitely one of my favorite 20th century Captain America stories. Sam gets a costume for the 90’s. Sam Wilson is still largely hanging around the Avengers during the oft-forgotten (perhaps rightfully so) Operation Galactic Storm event. Sam Wilson’s nephew, Jim Wilson, became friends with Bruce Banner and the Hulk. These core issues of Hulk explain his connection to Sam, as well as his tragic end in Marvel Comics in the early 90s. Foreshadowing Sam’s role in filling in for Cap when he’s unable. That strangely lingering question about whether Sam’s a mutant gets answered, by Jarvis the Butler of all people. Geoff Johns Run on Avengers gives Sam Wilson a far more prominent role on the team. Chris Priest takes on a short-lived Cap and Falcon run, that quickly dives in to Avengers Disassembled tie-ins with issues #5 to #7. Ed Brubaker and Steve Epting’s modern classic on Captain America is certainly more essential for Steve Rogers and the Winter Soldier. Nonetheless, Falcon plays a role throughout, and these comics set the stage for Captain America throughout the 2000’s. Sam has an interesting cameo role in the alternate reality of Marvel’s House of M. You can see the full reading order, in Comic Book Herald’s House of M reading order. Falcon plays a major role assisting Captain America in his side of Marvel’s Civil War. You can see the whole event in Comic Book Herald’s Civil War reading order. Sam reacts to the Death of Captain America. Siege full event reading order. 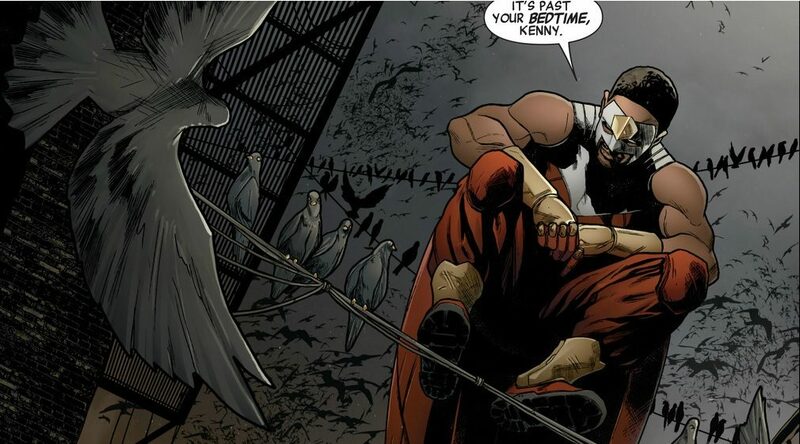 Falcon is one of many Marvel heroes helping out with a new Heroes for Hire from the all-time great Guardians of the Galaxy creative team of Dan Abnett and Andy Lanning. Following Rick Remender’s Marvel NOW! run on Captain America, in which Steve Rogers is sent to Arnim Zola’s Dimension Z, Steve Rogers returns to Earth-616 and Sam is by his side to deal with a major transformation. The events that lead to Sam Wilson, Captain America all begin here! After proving his heroic bonafides yet again, Sam Wilson officially transitions to Captain America. This Marvel Infinite comics collects Sam’s first official storyline as Cap. Collects: Axis event reading order. The 2014 Rick Remender Marvel event quickly turns Sam Wilson, Captain America into the worst version of himself. The new Captain America heads up his own Avengers unit. Rick Remender set the stage for Sam-Cap, and writes one full arc with Sam, Steve, and the new Nomad taking down Hydra. The final Captain America and The Mighty Avengers story before Marvel plunges into Secret Wars. Nick Spencer takes over writing duties across the Captain America franchise, starting with the ongoing Captain America: Sam Wilson. It’s an interesting take on Cap during the current political climate. Whereas Steve Rogers has pretty effectively stayed above the political fray (with plenty of classic exceptions, including the original Secret Empire and nearly running for President), Sam decides he can’t stay silent about political issues he strongly believes in. Naturally this results in the most polarizing Captain America of our time, judged more as politician than traditional superhero. Mark Waid’s new run on Avengers sets ups a team of Iron Man, Thor, Sam Wilson as Captain America, Ms. Marvel, Spider-Man (Miles Morales), and Nova. Needless to say, it’s not your grandfather’s Avengers! The Nick Spencer led Standoff event is absolutely essential reading for the state of Captain America, with major ramifications for Sam Wilson, Steve Rogers, and Bucky Barnes. Collects: Civil War 2 reading order. Note that Captain America Sam Wilson #9 can be read prior to Civil War 2 kicking off. Collects: Secret Empire event reading order.